The Vajra (Sanskr. Vajra: hard, mighty, thunderbolt, diamond, Tibet.) is an ancient symbol of the indestructibility which was already used over 10,000 years ago by shamans. Originally the Vajra (also : Thunderbolt) was supposed to have been the attribute of the vedic storm god Indra (Pali texts), who thereby killed and drove demons like Vritra. Indra is also titled there as Vajrabhrit(Vajra carrier), Vajrivat or Vajrin (armed with a Vajra), Vajradaksina (carrying the Vajra in the right hand), and as Vajrabahu or Vajrahasta (holding the Vajra in the right hand). But the Vajra is also an attribute of Shiva and Vayu. The Vajra or Dorje belongs here as 'upaya' together with the bell (Sanskr. Ghaṇṭā, Tibet dril bu) - 'prajna' - to the cultic devices of the buddhist lamas. It is used in ceremonies and during initiation, and it can have 3, 5 or 9 spokes . In Tibetan medicine a special crystal Dorje is used. A double-dorje or 'vishvavajra'  is a crossed Vajra. It represents the foundation of the physical world and is also attributed to certain tantric gods such as Tara, Sitatapatra, Vajrapani and Vajrasattva. It may e.g. also symbolize the cleansing of the 'twenty deluded views' of the five aggregates . In the Vajrayana the word Vajra is translated with 'Diamond'. 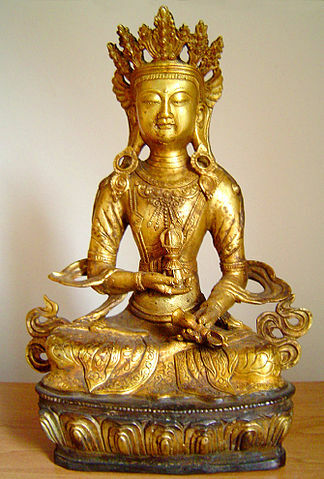 Here the Vajra symbolizes the indestructibility of the enlightened Vajra-spirit. A spiritual teacher is also called Vajracharya in Tantric Buddhism. Yamanta is here also Vajra-Bhairava. In Greek heraldry Zeus uses a thunderbolt. The Cyclops gave in out of gratitude several thunderbolts. In northern mythology Thor carries a thunderbolt.